In this issue, we present an interview with clarinetist, creator/host of the “Clarineat” podcast, and online entrepreneur Sean Perrin. 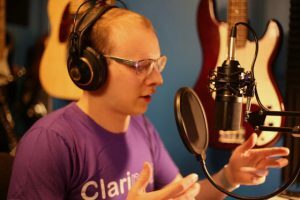 Be sure to check out Sean’s work at clarineat.com, and subscribe to his (free) podcast using your favorite smartphone podcast app. What is your background as a clarinetist? I pursued an undergraduate degree at the University of Calgary where I studied with Steve Amsel of the Calgary Philharmonic Orchestra. During my time in school I became very intensely interested in contemporary music, experimental programming and recording. I think a defining moment for me was realizing how much I enjoyed all aspects of planning a recital. The program notes, booklet and posters I assembled were little works of art. I obsessed over special lighting plans for different pieces, thought deeply about the order of program and the impact on the audience, and everything else right down to ensuring that my shirt matched the color of the napkins at the reception. I was videotaping my concerts and uploading them to YouTube in 2006, which was pretty much the strangest thing you could be doing. I was criticized for this by the community online because people insisted I didn’t want to be “known” for my work as an undergraduate and let it “define” my career. But I found this idea to be shocking! Why play in public at all then before you’re “ready?” I saw YouTube as an obvious worldwide extension of the concert hall. I wanted to get the music out there, and receive as much feedback as possible. One of my performances of Arvo Pärt’s “Spiegel Im Spiegel” has now been listened to approximately 200 thousand times since being performed live for a small audience of about 13 people at a lunch hour practice concert in 2008. People from all over the world, even to this day, message or comment telling me very personal stories of what it means to them when they listen and how it brought them to tears. There’s just no way to get that many people into a concert hall, and the internet as a performance venue has since become an obvious reality. For close to 10 years I have been almost entirely self-employed as a freelance musician in the Calgary region. I sub with local ensembles as both a clarinetist and percussionist. I have a private studio and teach over 100 in-school workshops per year around the city. Recently I recorded my first solo album called “Dreamsongs,” which is available on CD and all streaming sources. In addition to this I am now on the faculty of the Mount Royal University Conservatory. My work with my website has led to opportunities for social media work with D’Addario Woodwinds, and now Backun Musical Services, for whom I am the new online sales and marketing coordinator. It’s the perfect job for me since it seamlessly blends my passions for clarinet, technology and marketing. I also founded and host the “Clarineat” podcast. The best description of a podcast I’ve ever heard is that it’s kind of like music streaming, but for radio-type shows. Basically, you can listen to the audio content “on demand” whenever, wherever, and however you wish, from a smartphone or computer! Podcasts are almost always produced by a single person or small team, and tend to be niche-oriented, long-form conversations. What is the Clarineat podcast? The Clarineat podcast is a show about all that’s new and neat with clarinet, with the neatest people in the industry. The idea for the show came to me in late 2015. I had been looking for a clarinet podcast for a long time because I was doing a lot of driving and listening to a lot of podcasts, most of which I had become bored of. One day I was speaking on the phone for over an hour just chatting about clarinet stuff with my repairman Peter Spriggs and it suddenly dawned on me that this was exactly the kind of conversation I wanted to listen to. Clarinet players and classical musicians in general don’t often get a chance to share their stories unless they are extremely famous, and there’s so much interesting stuff out there. I’m thrilled be given the chance to speak with everyone and document life in the world as a clarinetist. How would someone listen to the Clarineat podcast? Listening is easy! The simplest way is to head over to www.clarineat.com and click “play” on the episode you’re interested in. If you want to keep up to date, be sure to subscribe using an application on your phone or other mobile device such as iTunes, Overcast or Stitcher. You can also consider joining the email mailing list because I release the occasional video or other content. You have had some of the world’s best clarinetists as guests—Stanley Drucker, Martin Fröst, and Ricardo Morales, just to name a few. How do you make that happen? At the beginning I just started contacting people I knew or who I thought could get me in touch with guests, and to my amazement almost all were interested. Nowadays nobody says “no,” and I have more people applying to be a guest than I can possibly accept. Getting to the big name artists has been surprisingly easy because I’m now in a position where their agents contact me directly. I guess word just kind of spread and the clarinet world is maybe smaller than we think! With social media the level of global reach one can achieve is amazing, and I owe a lot to this. This podcast would not have been remotely possible for someone like me to start 10 or 15 years ago. What is required to start a podcast? At the beginning all I had was some time, good intentions, and a microphone. It took a while to “find my voice” and learn not just the technical aspects of it, but the performance aspects as well. One thing’s for sure, though, if I had known how much I didn’t know, there’s no way I would have gotten started! But it has been a pleasure since I love learning. What kind of time investment is required to run a business like Clarineat? What do you spend that time doing? The average episode requires more than 20 hours of work. This includes booking a guest, having the interview, editing the conversation, mixing and mastering the audio, assembling the produced show, exporting the audio, uploading to the server, writing show notes pages, sharing on social media, composing an email blast and more. And there’s website maintenance, travel and a multitude of other commitments. What kinds of revenue streams are available to a podcaster/online entrepreneur? Podcasting is generally not incredibly lucrative. Most podcasts (likely 90%) do not make any money at all. Clarineat is a successful niche podcast because it is self-sustaining, due to modest advertising and generous listener support through donations and Patreon backing (an online patronage system). What kinds of benefits or opportunities have come your way because of Clarineat? I’m now “the Clarineat guy” when I go to schools for workshops, and the students expect that if I’m coming they will hear some great stories and get to dig into my bag of fun clarinet stickers. I’ve also gotten some work opportunities through Clarineat, such as my employment with D’Addario and Backun. The strangest part has been that I get recognized at clarinet events (such as ClarinetFest™). Some people even ask for a picture. At first I thought they were joking, but I’ve come to accept it. So much for podcasting being a rather solitary effort! But I always try to be polite and include people in what I’m trying to do. I’ve made some incredible friends through the podcast that I would not have made otherwise! The best Clarineat fan I ever met was a little girl who’d driven down to Florida [for ClarinetFest®] this past summer. Her dad said they came partly because she had heard I was coming, and since the whole family plays clarinet together they made the conference a family trip! How amazing, and they apparently listened to the podcast the whole drive down! That was completely heartwarming and moments like this make it all worthwhile. Do you have any advice for a clarinetist who might like to start a podcast, online business, or web presence? My advice to young clarinetists, or any I suppose, is just do it! Take a page of advice from Eric Salazar, who has now been on the podcast several times and is a friend I met because of the show. He’s a self-marketing genius and has grown his social media following from almost nothing to over 20,000 followers since I first connected with him two years ago. When he first called me for an interview he was upfront and said he was a young clarinetist, but was determined, was a huge fan of the show, and really wanted to be a guest. At that time I had been super focused on finding only big name guests, but he made me realize that finding people at the start of their careers is just as important, if not more so. If you have an idea, run with it. But do make sure it’s a good idea, and you have to be brutally honest with yourself about this because all ideas are not equally worth your time. You might have to try a dozen things out before one works, but you’ll learn something every step of the way.